Islamic State is caught between a rock and a hard place in Syria, as fighters backed by the US-led coalition made advances against the terror group in the north, while the Russian-backed Syrian Army drove towards the IS “capital” from the southwest. 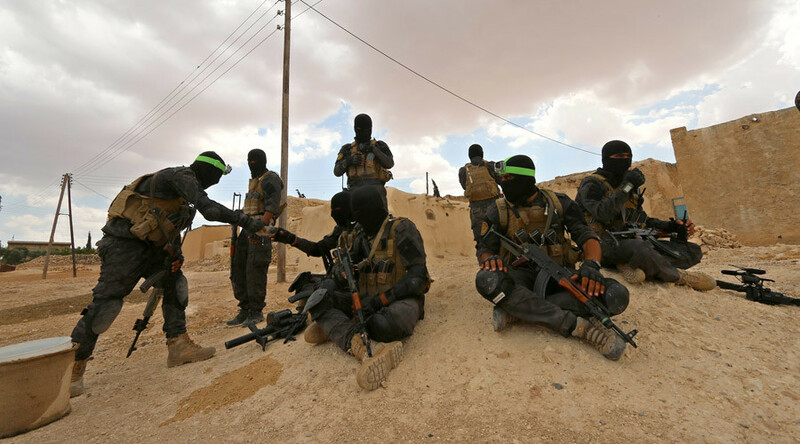 Arab and Kurdish fighters from the US-backed “Syrian Democratic Forces” continued their advance on Manbij in northern Syria on Wednesday, after their initial attack ran into heavy resistance over the weekend. The predominantly Arab force spearheading the attack suffered more than 100 wounded and a dozen killed, according to Colonel Christopher Garver, spokesman for Operation Inherent Resolve. One of those killed was Aby Leyla, commander of a “multiethnic unified local liberation force,” Garver told reporters at the Pentagon, speaking from the OIR headquarters in Baghdad. The forces engaged around Manbij are composed “85 percent of local Arabs, fighting to liberate their homes” in the area, Garver said. The so-called Syrian Arab Coalition will be in charge of liberating and holding Manbij, rather than the Kurdish forces that comprise the majority of the SDF. Assisted by a “small contingent of US special forces,” the SDF fighters have reached the outskirts of Manbij itself, but have held back from entering the city to limit harm to civilians, a spokesman for the group told Reuters. According to Garver, however, the SDF are “not hours out, but days out” of actually entering the city. The OIR spokesman did credit the militia for “significant gains” in the area, including a forced crossing of the Euphrates at Qarah Qawzah, due east of Manbij, which enabled a rapid advance on IS positions. With the support of over 105 airstrikes by the US-led coalition, the SDF have liberated 344 square kilometers from ISIS, the spokesman said. The goal is to keep the enemy #underpressure by making #Daesh fight in many places at once. We're keeping that pressure on. Days before the Manbij offensive began, it seemed like the main SDF effort would be north of Raqqa, the self-proclaimed IS capital. US special forces were photographed in the area wearing patches of the YPG militia that drew an official protest from Turkey, which considers the Kurdish militia a terrorist organization. Meanwhile, the Syrian Arab Army continued its own push towards the IS capital, advancing from the southwest along the desert highway into the Raqqa governorate. Their objective, according to local media, is to liberate the town of Tabqa and the nearby airbase, which would serve as a launching pad for the final push towards Raqqa, some 30 miles (50 kilometers) away. There was “no danger of collision” between the Syrian government forces and “our partners” on the ground, Garver told reporters Wednesday. Nor were there any plans to send more troops into the country, in addition to 300 US special forces and “other Coalition forces” inside Syria already, he said. The SDF was formed in October 2015 to combine the successful Kurdish forces with Arab militia “more acceptable to Washington's regional NATO ally Turkey,” according to Reuters.